When our five children were small and we were barely getting by on Greg’s teaching salary, the best Christmas gift ideas were things we could make ourselves. Life has changed, and I don’t often give handmade gifts anymore, but here are some beauties I’d like to make some day. Handmade Christmas cards. These can be a family project. I made these beaded candy cane ornaments with my kids when they were small. We made lots and gave many as gifts and used the rest on our Christmas tree. For extra sparkle, be sure to use red translucent and crystal clear beads rather than opaque red and white. Many of my neighbors lost trees during two horrendous storms this past summer. If I had known about this rustic Christmas tree project, I would have offered to haul away some of their branches. I’ve been wanting to make pillowcases this way. I’ve seen them done up in Christmas fabrics, juvenile fabrics, and designer fabrics. Gorgeous! Remember latch hook rugs? You can use the same technique to make rag rugs. The author used cut-up bed sheets and tied the strips to the canvas, but if you have a latch hook (you might be able to find one at a thrift shop), you could do it a lot faster. Crafty people, do you have more buttons than you know what to do with? (Did you inherit your Grandma’s prized button box?) Make a button garland. If you like to embroider, you can make a lovely snowflake/floral mandala. I find it hard to part with fabric scraps. I believe in my heart I’ll use them someday in projects like this English-paper-pieced bookmark. Now it’s your turn. Are you making Christmas gifts this year? Or have you in the past? What was a successful craft project? Share in the comments below. 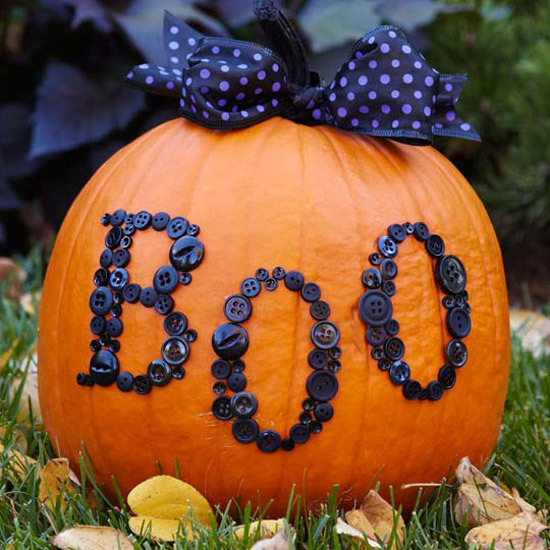 Have you carved your pumpkin yet? Thank you to Donna at My OBT for these fabulous examples. Have you carved your pumpkin yet? Here is some great inspiration from My OBT. Thank you, Donna!